Nassau, Bahamas - The Lillie family (Brian, Sanna, and their daughter Ivy) have waited for their summer vacation in the Bahamas to adopt their new family members after their two beloved Boxers passed away. 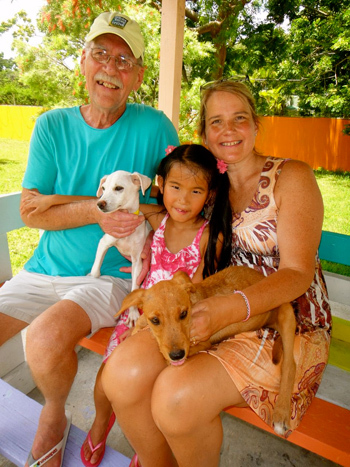 The family came to the Bahamas Humane Society and spent a long time playing with the puppies before choosing the two lucky pups. Mr. Lillie, a fine arts and photography teacher, did some Bahamian Folklore research and the little white female will be called "Lusca" and the little golden male "Chickcharney." "We wanted them to have true Bahamian names," he said. There are lots of people from different countries who want to adopt a Potcake. These dogs are highly regarded in other countries and people will go to great lengths and expense to get one to the US, Canada, South America and Europe. Most Bahamians do not realize what amazing dogs the Potcakes actually are. I hope that local residents will be encouraged to make Potcakes their family pets when they see how much foreigners love them. We have lots of lovely puppies and adult dogs at the shelter waiting for homes, and a very large amount of cats and kittens looking for people to adopt them. For more information please contact the shelter at 242 323 5138 and ask for Fiona or Linda.